In order to provide prospective students with the best chance at having a great education, we have compiled this list of the top universities and colleges in Utah. Some schools may excel at online programs while others may focus exclusively on the traditional, on-campus aspect of higher education. Regardless of the delivery format, these schools excel at providing a quality education for their students. As part of the Western Interstate Commission for Higher Education (WICHE), Utah offers a number of different benefits for its residents wishing to seek an online education. To make it easier for you to decide which school is best for you, we’ve compiled a list of the best online and traditional colleges in Utah. Thousands of students enjoy the many benefits that come with being a Utah resident, such as saving thousands of dollars while seeking an online or traditional degree through WICHE’s student exchange program. Besides providing financial benefits, Utah’s State Authorization Reciprocity Agreement allows students access to online courses regardless of their geographical boundaries. In 2011, the Utah state legislature funded the Statewide Online Education Program (SOEP), which provides access to high-quality digital courses regardless of where students currently attend high school. Enrolling in these courses receive a significant advantage if they plan to pursue a program through a Utah online college. Getting a degree in Utah is now easier than ever, no matter what your circumstances are. Whether you’re busy raising a family, suffering from a disability, or serving in the military, online classes provide a number of benefits for nontraditional students who can’t attend a traditional institution. Utah residents have access to a number of accredited online colleges that provide the same high-quality education and marketable credentials as those who go the more traditional route. To help prospective students narrow down their choices, below is a list compiling the best colleges in Utah of 2018. 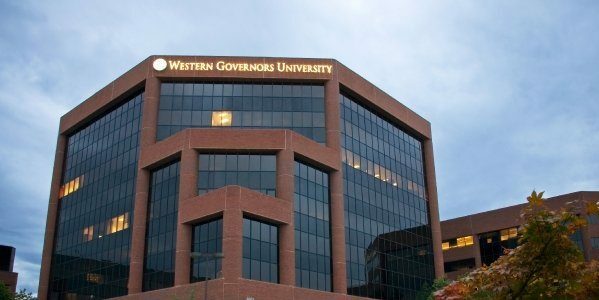 Whether you’re an in-state or out-of-state student, Western Governors University is one of the best online colleges out there, providing affordable tuition rates and numerous online program offerings. The university’s headquarters are in Salt Lake City, but all its courses are completely available through their distance learning platform, their online program. WGU offers 20 bachelor’s degree options, and there is a personal mentor assigned within each subject area whose purpose is to help the students graduate as fast as possible. Founded in 1997, WGU does not require prospective students to submit entrance exams such as the SAT, ACT, GRE, or GMAT, unlike other Utah online colleges. Another way in which WGU differentiates itself from other schools is the way they charge tuition. Instead of charging per credit, WGU charges its students a flat-rate fee every six months, encouraging its students to graduate as soon as possible. Located in Salt Lake City, Independence University boasts a number of programs available to students. Providing a variety of academic areas to choose from, such as graphic arts, technology, business, and healthcare, IU is a good choice when it comes to online colleges. To ensure that each student graduates successfully and on time, IU assigns an associate dean to work one on one with them. IU also provides free career development for current students and alumni. In order to help their students even after they graduate, IU uses their connections with local and national employers, as well as alumni, to help students network and find jobs in their particular fields after they graduate from the university. IU has some of the best student resources for online students in the state, providing necessary equipment (such as laptops), supplies, and textbooks to help students complete their coursework at no extra cost. In addition to providing their online students with individual web-based courses, the University of Utah is among a number of institutions in the state to offer degree programs. The U of U has hundreds of online classes available to students so that they may fulfill the requirements needed to earn a bachelor’s degree. One thing that sets U of U apart from other Utah online colleges is that they offer one minor online: an undergraduate minor in gerontology. The on-campus faculty of the university is the group in charge of creating the courses and serve as instructors for the online student body. Online students follow the same 16-week schedule that the students in the classroom follow. Faculty members serve as knowledgeable and accessible mentors to online students taking their courses. The university offers a variety of resources to their online students in order to help them succeed, such as academic advising, remote library access, and web-based tutoring. In-state students looking to complete an online degree program can make a financially-strategic investment by being part of Utah State University’s online program. Offering seven bachelor’s degree programs online, USU offers a reasonably priced education for Utah residents. Not only can students offset their costs by using the university’s extensive financial aid options, but tuition is also less than $300 per credit. Since its inception in 1997, USU’s online program includes a number of services offered to their distance students, such as online tutoring, technology help, financial aid counseling, remote library access, and academic advising. Two unique features that help distinguish USU from other online colleges is the software discounts they provide their students and the option to get involved with the Center for Women and Gender. Offering a range of subjects for their online students to choose from, Weber State University is among a number of Utah online colleges to stand out from the pack. WSU offers six undergraduate degree programs that focus on the healthcare field. From Health Information Management to Radiologic Sciences, WSU serves as a great option for online students looking to enter the healthcare field in the future. There are two online course delivery options for students to choose from: independent study classes and semester-based classes. Independent study classes are a great choice for those looking for more flexibility, as they can be taken at any time, so long as they’re completed within six months of the start date. Students taking the semester-based option will be on the same schedule as the students in the on-campus Ogden classes. These options are just one in a number of ways that WSU helps its online students reach their goals of graduation successfully. Specializing in the liberal arts and sciences, Southern Utah University offers 140 graduate and undergraduate courses throughout the year for its online students. Students may enroll in most of the university’s online courses throughout the year, but the majority of classes are available from May to the end of the summer. SUU offers associate, bachelor’s, and master’s degrees to its online students. SUU offers general education classes, an associate of arts degree in science, and an associate degree in paralegal studies. It also offers bachelor’s degrees in accountancy, management, general studies, and communication. One of the unique options SUU offers is a prior learning assessment course, which allows its students to put together an electronic portfolio highlighting their previous work experiences and possibly provide up to 15 credits towards a bachelor’s degree. SUU’s online curriculum is available through the Canvas LMS. Whether it’s a bachelor’s degree in business administration or a master’s degree in strategic communication, Westminster College offers a variety of programs for prospective online students to choose from. One of the unique aspects of WC is its competency-based learning, a concept it employs for its online students in order to emphasize the importance of learning a predetermined set of knowledge, skills, and abilities, which WC refers to as “competencies.” Instead of focusing on letter grades, WC makes sure that their online students demonstrate their knowledge in measurable ways so that they will be ready to apply their learning in their workplace once they graduate. Each online student at WC is assigned an academic adviser whose purpose is to help students plan their schedule and enroll in classes. Like other universities that provide online education, WC uses the course management system Canvas to help students in different areas of their learning experience, such as taking tests and communicating with other students. In addition to offering financial aid through FAFSA to eligible students, WC offers grants and scholarships to its online students. Utah Valley University offers a variety of programs for students interested in their online and distance learning programs, whether you’re interested in continuing education or student drivers, among others. Ed2Go is partnered with UVU to provide open enrollment programs for students interested in continuing education, and CareerStep offers online medical training for UVU students. UVU also offers English as a second language as an online course. Online students also have access to a career development center and testing services. Like Westminster College, UVU uses Canvas, through which their students may communicate with professors and submit class assignments. For students looking to get a Utah Valley University online degree, the university provides both hybrid and fully-online classes, in addition to digital course content for on-campus classes. UVU, which is accredited by the Northwest Commission on Colleges and Universities, is a satellite campus, which increases the options for attending classes in an on-campus environment for the completion of certificate programs, associate, bachelor’s, and master’s degrees. Online students also have access to technical support through the Office of Teaching and Learning, which also provides exam proctoring when an in-person exam is required. Stevens-Henager College offers both undergraduate and graduate degrees that can be completed either partially or fully online, including majors in technology, graphic arts, and business. SHC provides tutoring and career services for its online students and also has several locations throughout Utah and Idaho. SHC also helps its students by offering a number of scholarships in addition to financial aid through FAFSA. The approximate time of completion for an associate degree in SHC is 20 months, whereas for a bachelor’s degree the approximate time is 36 months. Many programs in SHC provide the equipment and texts necessary to complete them. This helps the student focus on learning instead of having to worry about money. The list draws from the highest ranked online and on-campus programs around Utah, with the majority of the rankings determined by the number of online programs available. Check out our methodology page to determine what the other factors were that went into the ranking of this page. We invite schools featured on our list or not highlighted to reach out for possible inclusion in an updated version of our list. We’re constantly looking to recognize top-tier institutions.